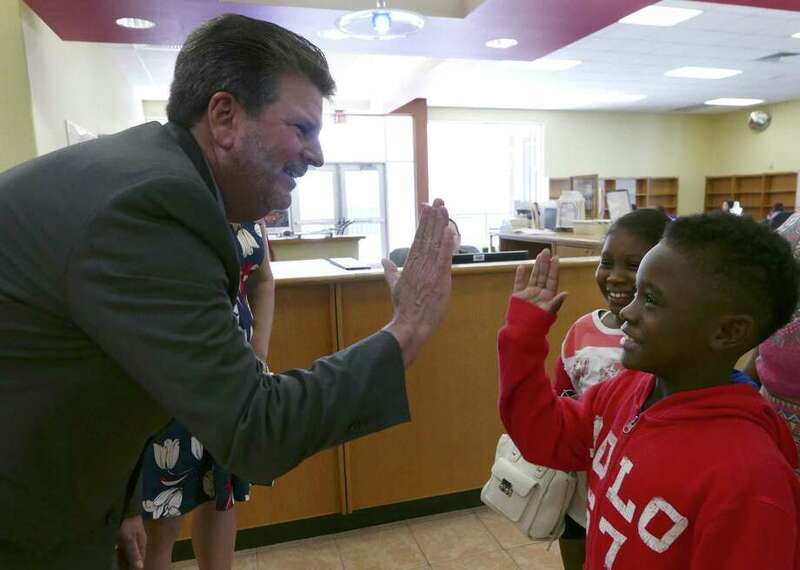 Southside ISD Superintendent Mark Eads offers a high-five to new student Ronnie Spencer as his sister, Raniyah, looks on on Tuesday, Aug. 8, 2017, the first day of registration. Ronnie will be in the third grade while Raniya will be in the fourth grade. Mark Eads has already overcome one symbolic hurdle on the path to stabilizing the Southside Independent School District. “Well, for one thing, I’ve been superintendent now for over a year,” Eads said. That’s something like longevity at the rural South Bexar County school district. Southside operated under three interim superintendents between summer 2015 and spring 2016, when Eads was hired. The last permanent superintendent, Ricardo Vela, held the title for a year and four months before he was fired. His predecessor lasted longer — but was also fired. Eads said he understands that improving the troubled district means more than just hanging on to his job, and this school year, he has a fresh start with the board of managers appointed in May by Texas Commissioner of Education Mike Morath, in a wholesale replacement of elected trustees. Community members are counting on Eads’ success. Eads said he’s also counting on himself and his leadership team. Southside ISD has about 5,700 students, 81 percent of them considered “economically disadvantaged” based on federal income benchmarks. In recent years, the district has been known for high employee turnover at all levels and board mismanagement that prompted the Texas Education Agency takeover. As the district went through leader after leader, its scores on some standardized tests plummeted to the lowest in Bexar County. Since Eads took over, he said, employees have constantly told him that standard procedures either did not exist or were not being followed. Eads attributed the disorganization to employees being left for years to rely on their individual, differing judgments.One of Eads’ first actions as superintendent was to undertake a complete review of district finances, personnel and curriculum. He used the findings to completely overhaul the district’s administrative team, especially at the secondary school level.